Registration for the 2016-17 season and skating/skills clinic opens August 15. Registration for the season is closed. Registration for the skating/skills clinic is open until September 15. Register here! Season runs October 4 to March 18. Games are played Tues, Thurs, and Sat evenings, and possibly Sun afternoon. Space is limited. First 90 registrants (not including goalies) are guaranteed a spot on a team. Additional registrants are added to the wait list in order of registration received. Teams are selected by draft. We will contact you the week of September 19 with your team assignment. 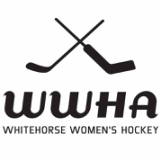 For more information on the league, including fees, wait list, ice times, refunds etc. ﻿click here﻿. For more information on the clinic, ﻿click here﻿. New Step! This year we are asking players to register online. Why? This will save your volunteer Board a lot of time when it comes to entering names and associated information into a database, and will allow us to better track registration. Thank you for your patience in testing this new system. Unfortunately, we are not able to accept online payments this year. Step 1. Register online: Sorry, league registration is closed. Click on the link above and complete the league registration form. Click on the link above and complete the clinic registration form. Step 3. Download, print and sign the Signature form. Click here. Hardcopies of the Signature form will also be available at Sport Yukon. Step 4. Pay Registration Fee(s) and submit Signature Form at Sport Yukon. Fees must be paid within 7 days of registering online or your registration is void. For example, if you register online on a Monday, you have until the following Monday to drop off your fees. Fees will not be accepted after September 12, the last day of registration, regardless of the day you registered. Take your registration fee (cash or cheque) and signature form to Sport Yukon (4061-4th Ave), Monday to Friday, 8:30 am – 4:30 pm. Fees must be paid within 7 days of completing the online registration form or your registration is void. Fees will not be accepted after September 12.